Helichrysum essential oil, ECOCERT, Corsica is also referred to as Helichrysum Angustifolium. It is a low yield oil, steam distilled from flowering tops. The aroma is sometimes described as intense, pleasant, sweet, honey-like, tea-like, slightly fruity, and slightly buttery. Despite the varied descriptions most perfumers agree it is amazingly complex. Aromatherapy experts have logged dozens of uses. A wonder for healing bruises, gashes and wounds, Helichrysum is also used extensively for inflammation and pain. And though expensive it adds amazing notes to blends. Chamomile, Citrus, Geranium, Lavender, and Clary Sage produce pleasant results when blended with Helichrysum. Although costly, it can be added to blends in moderation with good results. Please note that this oil can be difficult to get at times. When sizes are not listed on the webpage it is because there is a limited supply. Species: Helichrysum italicum G. Don (H. angustifolium D.C.) (Immortelle), Asterac. The health benefits of Helichrysum Essential Oil can be attributed to its properties like anti spasmodic, anti coagulant, anti allergenic, anti-microbial, anti-hematoma, anti-phlogistic, nervine, anti-inflammatory, anti-tussive, cicatrisant, expectorant, febrifuge, anti septic, cholagogue, emollient, mucolytic, fungicidal, hepatic, diuretic, splenic and cytophylactic. Helichrysum, the flower that gives that “Everlasting” and “Immortal” Essential Oil, and known by the names Helichrysum Angustifolium and Helichrysum Italicum, is an European herb native to France, Italy and a few neighboring countries. This is a very costly oil and scarcely available, but unlike other essential oils which have short shelf life, this oil can be stored for a long-long time. See the author's personal notes at the bottom. It's a wonder of an oil to have on hand for those "emergency" moments. If you have boys in your family, this is an oil for you! This oil has a whole range of remarkable medicinal properties. Some of them are listed below. 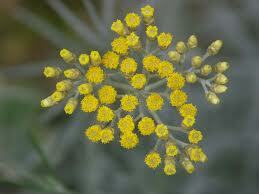 A sacred and gentle healing oil Helichrysum italicum is used for tissue repair and healing. Highly regenerative, Helichrysum oil is one of the strongest essential oils for relieving inflammation. Its ability to prevent swelling and inflammation and to accelerate the formation of new tissue is legendary. One can almost see it working, it is so powerful. Helichrysum oil will work for all conditions in which inflamed tissues need to be calmed down and regenerated. It's absolutely amazing! Research shows Helichrysum oil's notable anti-hematoma and skin regenerating activity is superior to any other essential oil. It protects newly formed cells and is known to regulate cholesterol. Helichrysum promotes circulation in areas of stagnation and blockage and stimulates the growth of liver cell formation and lymphatic flow. An effective free-radical scavenger Helichrysum oil is especially beneficial for renewing the skin. Apply Helichrysum oil in a hot compress on injured or badly bruised tissue after an accident or injury for immediate pain relief and rapid healing. Helichrysum italicum's regenerative powers have been used with phenomenal success for both old and new scars. Helichrysum oil functions by way of re-absorption through your blood into the tissue where it actively removes cellular debris in areas of bruising, resulting in less pressure on your nerves with subsequent relief of pain. Through enhancing circulation (blood, lymph & nerve) Helichrysum italicum acts to help mend broken bones and supports the formation of healthy skin tissue. Excellent as a massage lubricant to speed healing of an injury use Helichrysum to relieve muscle ache and joint stiffness. Helichrysum may help reduce hypertension. CHAKRA CARE: Use Helichrysum italicum oil to balance and heal the 1st (Muladhara - Base or Root), 2nd (Svadhisthana - Sexual/Spleen) and 3rd (Manipura - Solar Plexus), 4th (Anahata - Heart), and 5th (Visshudha - Throat) Chakra. * Other Benefits: It detoxifies liver, relieves congestion, neutralizes effects of nicotine and caffeine and helps cure herpes, cystitis, arthritis, sinusitis, colitis, neuralgia and varicose veins. It has uplifting effects on mind and improves meridian flow. Few Words of Caution: No toxic or irritating effects observed. But being an anti coagulant, those who have undergone surgery or have chances of internal hemorrhage should avoid its use. Blending: This Essential Oil blends well with Geranium, Lavender, Rose, Lime, Neroli, Orange, Petitgrain, Sage and Ylang-Ylang Oil. A personal note: As a family, although this oil is expensive, we have found it worth every penny. We keep a small bottle out at the barn to apply to bleeding wounds (such as when scabs from dehorning have been bumped off, or when the umbilical scab broke off a calf and was bleeding out). We have applied diluted helichrysum essential oil to wounds that probably needed a couple of stitches, but we didn't want to deal with ER expenses. These wounds healed with absolutely no scarring (on the forehead and hand). This oil is perfect for head wounds that want to bleed so much. It immediately stops bleeding. Helichrysum oil is also excellent to prevent bruising, or take out bruising. A customers large leg wound that was incredibly swollen and bruised healed at an incredible rate and really surprised his doctor.